Daily baths are a relatively recent invention though. Back then, people would bathe once a month, maybe even once a year. Meanwhile, ‘barbarians’ like the Vikings were considered clean freaks because they bathed once a week. So much for being uncivilised. All this meant public pools/baths got very dirty very quickly and had to be frequently filtered. Around the 1890s, scientists used electricity and to make bleaching powder by mixing lime and chlorine gas. The main product was calcium oxychloride (bleaching powder), and chlorine was seen as a useless by-product. It could also be formed from electrolysing sodium hydroxide (caustic soda), and by the 1900s, chlorine was commonly used in pools. Nowadays, we have two other options – saltwater systems and mineral filtration. The main difference in these pool types is the filtration system. Salt-water pools use a mix of salt and chlorine. Salt-water chlorinators turn the salt into liquid chlorine, so you don’t need to add as much solid chlorine. Mineral pools – on the other hand – use pool ionisers to seep mineral ions into the water. The salt, chlorine, and minerals all work by killing bacteria and discouraging algae growth. 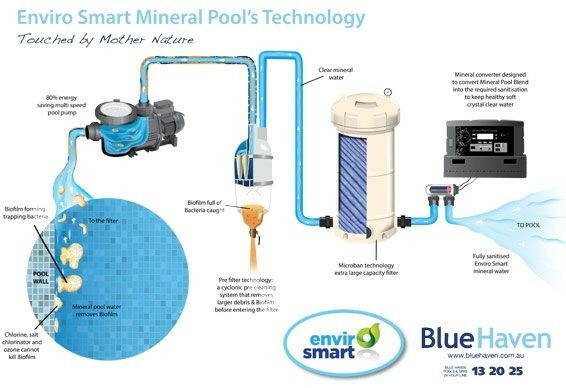 Minerals pools are thought to be more effective against algae. They’re also thought to be kinder on pool surfaces, skin (and bathing suits) than salt or chlorine because they have no bleaching effect. They can cause discolouration though if the minerals levels become excessive. That said … even mineral pools are infused with minimal amounts of chlorine. Salt-water pools and chlorine pools need you to routinely check water chemicals and adjust them accordingly, while mineral pool ionisers use pre-calibrated cartridges that monitor their own rates of release, with no further action on your part. Because mineral pools use far less chlorine, the walls and floors of your fibreglass or concrete swimming pool won’t need maintenance or resurfacing as regularly. The water in mineral pools feels more natural on your skin, and since there’s less chlorine (whether the chlorine is in solid or liquid form), it smells better and doesn’t dry out your skin as much. Mineral cartridge filters are cheaper to install than other chlorinators but need replacement every season, while a salt cell can last 4 to 5 years with frequent cleaning. In a mineral pool, you don’t need to add chlorine, clarifiers, or algaecides to your pool, and you conserve both water and power, saving up to 12,000 litres of water annually. Your pool operating costs will drop up to 80%, and you’ll never need another pool testing kit. Salt-water pools convert salt to chlorine and back to salt on a continuous loop. Mineral pools take a few weeks to get the pH right after installation but don’t need much maintenance after that. Basically, a chlorine pool uses … well … chlorine. Salt-water pools use some raw chlorine mixed with salt and convert the salt into liquid chlorine. So, you’re putting in less chlorine, but you’re still generating the same amount. Mineral pools use silver and copper ions, borates, magnesium chloride, plus a tiny amount of chlorine. The mineral water feels silky on your skin, offering more of a spa feel than a swimming pool one, and it costs less both in terms of installation, utilities, and maintenance. And they smell better too. 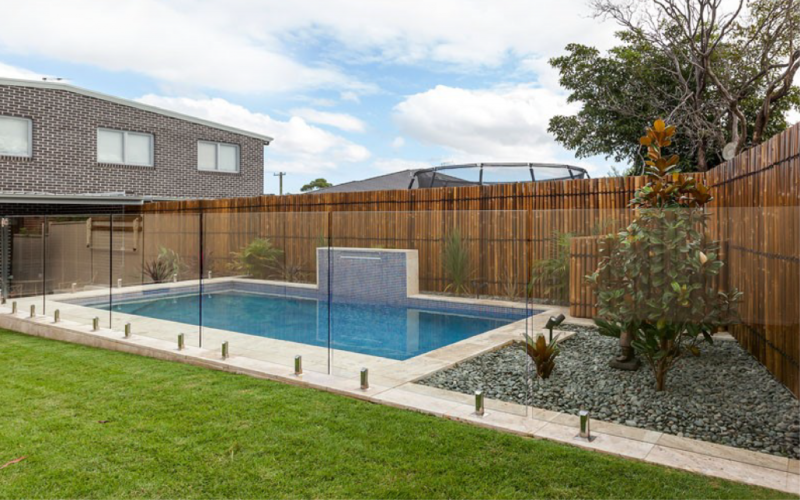 For your choice of swimming pools – mineral or chlorinated – call Blue Haven Pools today on 13 20 25.